Polenta is an interesting ingredient. It is made from ground corn. It is normally cooked up with liquid. It can either be enjoyed as I show you in this recipe, or cooked into a firm, set block which can then be sliced and fried/baked. Polenta can also be used to substitute flour and added to cakes – it tastes especially good when paired with orange or lemon (recipe coming soon!). We don’t tend to eat a lot of this in the UK, but it is popular in both Italy and the USA. From what I discovered today, we need to eat more of this. It is delicious! Cheesy Polenta is so simple to make, in fact it was easier than mashed potato. All I did was add the ingredients into the pot, stirred until thick and then served. No peeling or chopping required! I had loads left over, and it was delicious warm and cold. 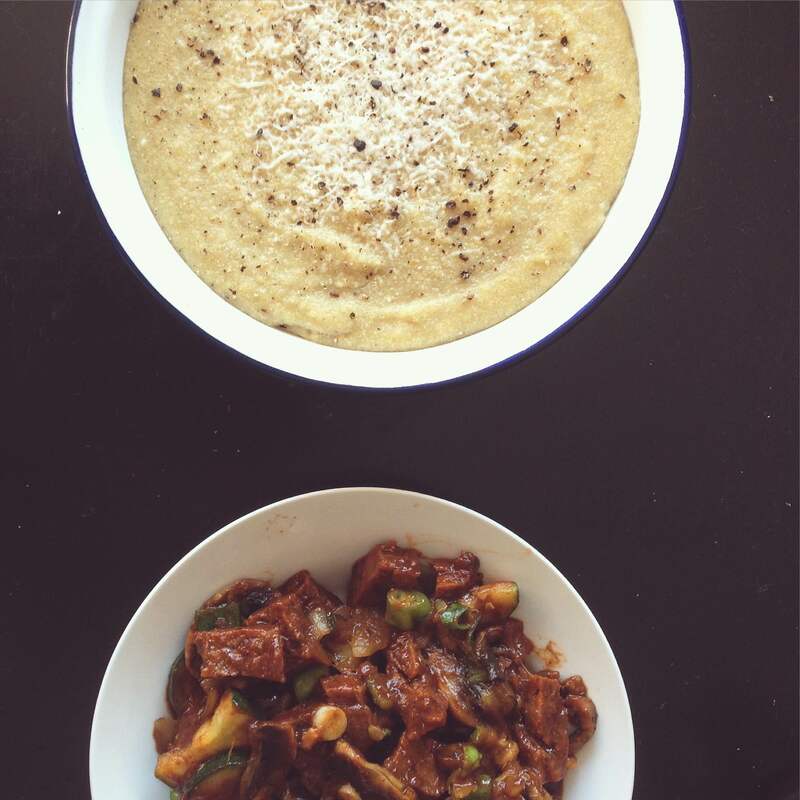 I served my cheesy polenta with a BBQ seitan, mushroom and courgette stew. It was really filling and so tasty. This recipe made enough for dinner and lunch for most of the week. 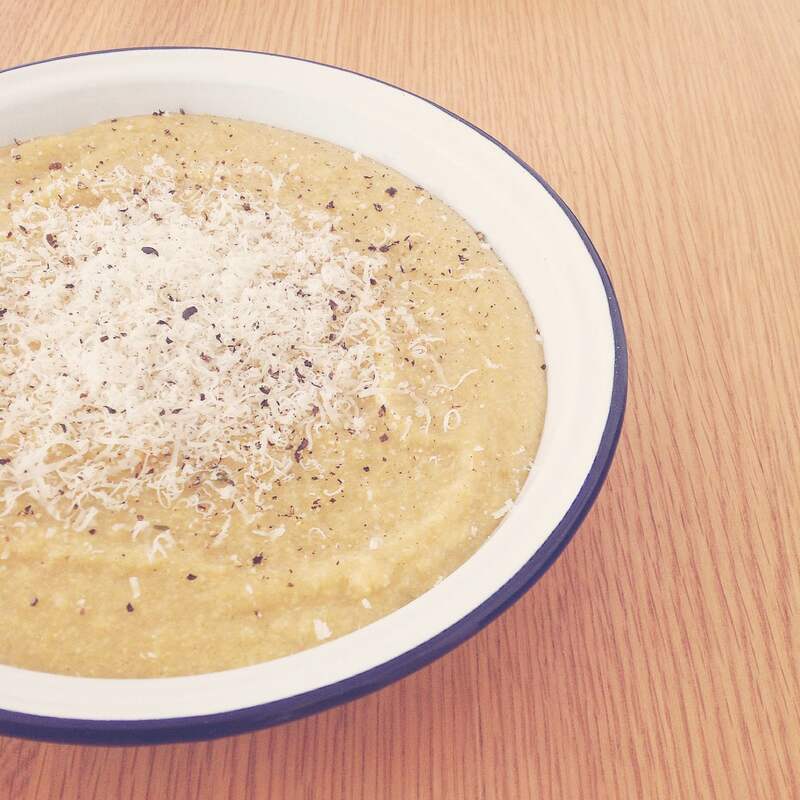 Polenta is very filling, and so I found that we actually ate less in comparison to potato. Cheese really is a must here. You can make it healthier by omitting the cheese, or you can enjoy this dish for its warming, comforting energy and maybe just got for a run the next day. In a pan, bring the water to the boil. Add the stock cube, porcini powder, garlic powder and bay leaf. Turn down the stock to a simmer and add the polenta. Whisk as you add. This is crucial so you avoid lumps. Whisk until the grain is combined. Allow the mixture to bubble and thicken, stir frequently with a wooden spoon. This should take around 10 minutes. Remove from the heat. Stir in the yoghurt, butter and cheese. Ensure you leave some cheese to sprinkle on top when you serve. Season with salt and pepper. Half a white onion (diced). 4 heaped tbsp pre-made BBQ sauce. 1 tsp Noble Sweet Paprika. 4 baby tomatoes roughly chopped. Chopped Pickled Jalapenos to serve. Spritz the cooking oil into a pan on a medium flame. When the pan is nice and hot, add the onions and garlic. Saute until the onions become translucent. Add the courgette, mushroom and green pepper and cook until the vegetables begin to soften. Add the Seitan, BBQ sauce, Noble Sweet Paprika, Cayenne Pepper, Garlic Powder, Onion Powder, Vegetable Stock and Baby tomatoes. Bring to a simmer and allow to cook for about fifteen minutes on low. This allows the spices to enrich the vegetables and seitan with delicious, delicious flavours. Serve and top with jalapeno chillies and grated cheese! There you have it! The perfect comforting, autumnal supper! 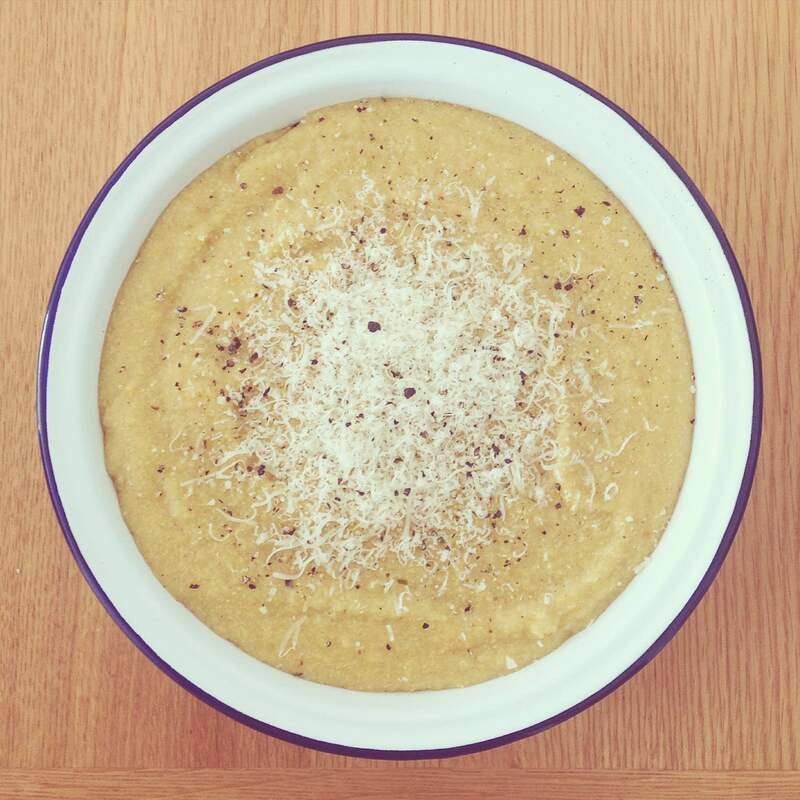 Have any of you used polenta before? If so, please let me know what you think of it! Happy Thursday everyone! Posted on September 10, 2015 January 7, 2016 by TinaManahaiPosted in Dinner, RecipeTagged Autumn, bbq, Cheddar, cheese, Cornmeal, dinner, Polenta, recipe, Seitan, side dish, The Brighton Kitchen, Vegetarian. Previous Previous post: Adventures in Poland!